We would have easily assumed that a social site like Pinterest would be out of reach from hackers. It’s not because it is hard to crack but because there is not much personal information on Pinterest to sniff for. However thanks to the ever (sky) rising popularity of Pinterest it started to attract the dark world. I received few Emails as shown below, at first I thought it’s from spammer and ignored them. But finally decided to check it out to find what is going on. 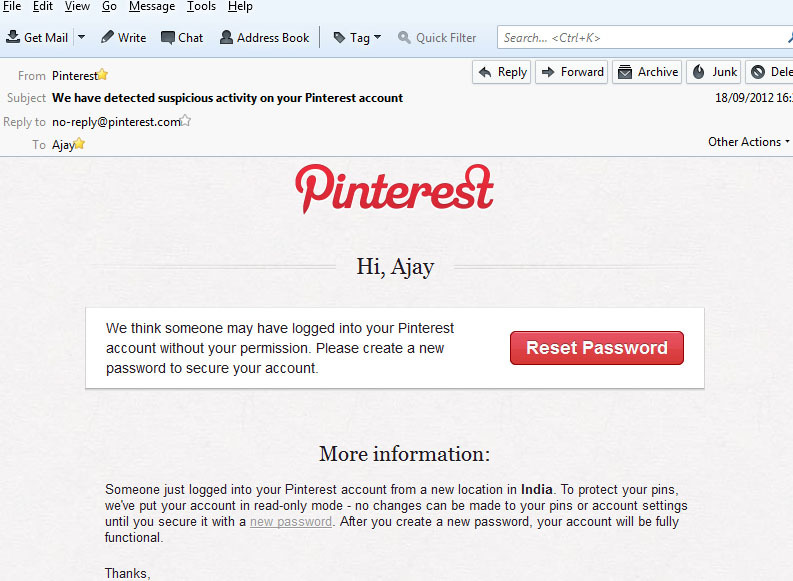 The first thing was to check the source of e-mail which turned out to be from Pinterest itself. Next was to check the message. We think someone may have logged into your Pinterest account without your permission. Please create a new password to secure your account. Well sounds kind of intelligent stuff, how did Pinterest knew that the logged in person wasn’t me? Someone just logged into your Pinterest account from a new location in India. To protect your pins, we’ve put your account in read-only mode – no changes can be made to your pins or account settings until you secure it with a new password. After you create a new password, your account will be fully functional. 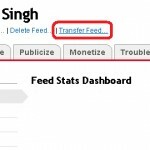 Someone accessed my Pinterest account from India? WTF! Since when Indians started to become hackers. I checked the old such messages and found that account was accessed from Russia, sounds all familiar. What Next I logged into Pinterest account and found it was changed to be a Read Only account as mentioned in the message. Your account is read-only mode to protect your pins from suspicious activity. 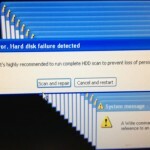 Please reset your password to secure your account. So far so good, all was safe and sound and none of my Pins were touched. What to do when your Pinterest account has been victim of unauthorized access? The first thing you need to do is to change the password to be more complex. Like any other website on the web, Pinterest is also prone to security threats and I would be surprised that Pinterest security has been breached. Better be safe than sorry. Take all usual precautions to secure your Pinterest account. If you ain’t geek and not sure if clicking on links inside massage is safe, don’t click on them. It wouldn’t take much time for spammers to start sending out similar spam message and diverting clicks to their own page to hijack your account details. So be on safe side don’t click on any links inside the message but visit Pinterest and change password from there.